Catwoman Deluxe Adult is a dead ringer for Halle Berry's catsuit in Catwoman, the movie. Cat Woman Mask inspired by Michelle Pfeiffer's. 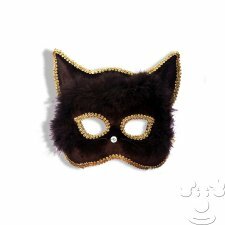 BuyCostumes also carries sequinned cat ears, fluffy tails, open toed platform shoes, boots, wigs and makeup.